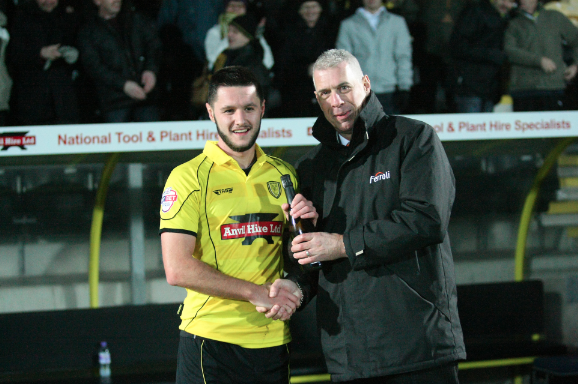 As keen supporters of Burton Albion FC, everyone at Ferroli was especially proud when the Brewers won their match against Cheltenham Town on Saturday 11 January at the Pirelli Stadium. They kept us in suspense until five minutes from the end, but it was worth the wait when Dominic Knowles made it 2-1 to close the first match that had been entirely sponsored by Ferroli. With Burton Albion currently sitting almost at the top spot of Football League 2, we believe we are backing true winners and are looking forward to supporting the team in their quest to take the title at the end of the season. As match sponsor, it was our privilege to choose the man of match and that honour went to Dominic Knowles, who scored both goals. Pictured here is Ferroli’s Andy Dimond presenting Dominic with a much deserved bottle of champagne.